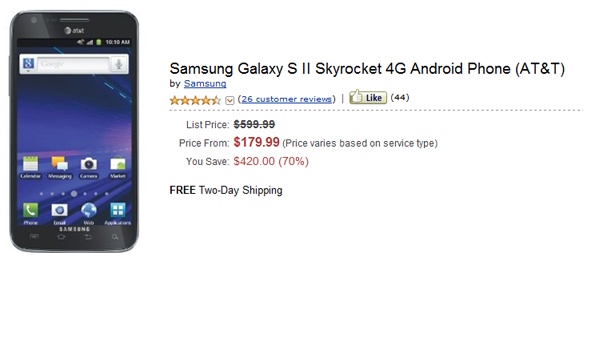 Just a quick note to let you guys know that the various iterations of the Samsung Galaxy S II are on sale over at Amazon Wireless. Depending on which carrier you are looking for, the hot Gingerbread devices range in price from $99.99 up to $199.99 with contract. Sprint’s model, the Epic 4G Touch, is the least expensive while T-Mobile’s is the costliest. For some reason, they are asking for more than AT&T and their Skyrocket. We expect these prices to begin to bottom out as new models are introduced at CES and Mobile World Congress in the first part of the year. That said, we don’t know if these exact sales will stick around for long and/or go back up a bit. Reminder: Amazon is offering $100 gift cards to anyone who purchases any Android phone and activates the mobile hotspot feature. Any.